Diana played piano for our wedding and was terrific! We coordinated with her to play our "first dance" song, and she sent us a bunch of recordings tailored to our specific needs. During the dinner she played a number of our favorite songs, and she was very flexible and accommodating to last-minute modifications to the event schedule. She is highly responsive and responsible, and an excellent pianist as well with an expansive repertoire. Definitely recommend! Diana was AMAZING to work with! We worked with her for our wedding this past June, and she exceeded all of our expectations. Not only does she have a stunning voice and is an incredibly talented pianist, but she was so focused on making our day perfect. She even learned some of the songs we had requested to be played by ear! I can't recommend Diana highly enough. And, with the stress of wedding planning it was awesome that she was such a dream to work with. I just sent her a list of our ideal songs, we hopped on a quick call and that was it. We even got a CD recording of all of the songs in the mail :-) Thank you for making our day so perfect, Diana!!! Diana did an amazing job playing/singing at our wedding. She learned our favorite songs perfectly, was responsive, kind, punctual, affordable, flexible with scheduling, and went above and beyond to make our day special. Thanks Diana! I am very pleased to have found Diana Li. I heard her video clips on you tube and I knew right away she would be a perfect fit for my wedding. Her vocal and piano skills are amazing. I was so happy that she was able to memorize a special Chinese song request on such a short last minute notice. Me and my wife loved all of the English and Chinese songs she sang and played. Her price we found to be very reasonable and best of all she comes professionally equipped with her equipment in case the venue doesn't provide any microphones or speakers. I can almost guarantee that you won't be let down at all. Thank you so much for making our night memorable. You could not ask for anything more. She was professional, sweet, a great singer and pianist. If you are looking for someone for your event, look no further. Diana is AMAZING!!!! A few weeks before my wedding, the music director at my church left, so I was told that I needed to find my own musician for the wedding. I panicked because I thought that I wouldn't be able to find someone with such short notice. I reached out to Diana, and she immediately and enthusiastically said that she would be honored to sing at my wedding ceremony. After only a couple of phone calls, Diana put my worries at ease. She worked directly with the church coordinator and a pianist to successfully plan out the music for my wedding ceremony. I was amazed how quickly she was able to learn the songs and how professional she was from start to finish. During the wedding ceremony, I was brought to tears because her voice was so beautiful. In fact, it brought several of my guests to tears because of her amazing angelic voice. When I think back on my wedding, one of the best moments was when Diana sang the Ave Maria song. Till this day, I still re-watch the video of her singing, and it makes me tear up. I highly recommend Diana to sing or play piano at your wedding. You can't find anyone better! Eden, that is incredibly sweet and I'm just so glad I was able to perform at your stunning wedding! Thank you!! I don't usually write reviews because I'm a busy person but after having Diana perform at our wedding ceremony, I knew I had to take the time to let everyone here know how awesome she is!!! We were so lucky and blessed to have found her. She was a pleasure to work with. Her communication was always smooth and pleasant. She explained everything in detailed and provided advice and a list of suggested songs for every part of our ceremony. She has a huge repertoire of wonderful weddding songs and she sings like an angel. She gave our wedding that romantic touch we were looking for. Her price is very affordable too. Highly recommend her !! Diana is a true professional that was easy and fun to work with. she is extremely talented and made our wedding very special! I would highly recommend her! We so enjoyed working with Diana. She went above and beyond with our requests. She played and sang our special songs so beautifully it seemed as though she had known them forever. She never hesitated to learn new songs and was masterful at the songs she knew. Our guests were amazed that even though she played for four hours, she never repeated a melody. We were so blessed to have her. Thank you Diana for being so easy to work with. Your professionalism and hard work ethic were stellar. Our wedding day was even more special because of you. You sang and played like an angel. We hired Diana to perform for our wedding last week, during the ceremony and cocktail hour, and she was wonderful! Leading up to the wedding she was easy and wonderful to work with, accommodating my last minute changes, and going with the flow. During the ceremony, she set the mood perfectly as I walked down the aisle, with her beautiful voice. Though I didn't get to hear here during cocktail hour, many of our guests said that they loved her playing and her song choices (especially the Disney tunes). If you are looking for a special performer to make your wedding day even more unique, I would highly recommend Diana! Diana is amazing and so very talented. We had the pleasure of her playing during our wedding ceremony and she sang during our first dance. It was so special and perfect! My husband and I had found a song for our first dance and sent the link and lyrics to Diana. A couple weeks later, she had learned the song and sang it to perfection. Both my husband and I were thrilled and it was certainly a highlight of our special day. I strongly recommend Diana for your day. You certainly will not be disappointed!! Hi Linda! Thank you so much for your review, and I'm so happy you enjoyed the first dance song! I enjoyed singing it as well...what a powerful and beautiful song you chose! :) I wish you both the best! Diana performed at our Wedding Ceremony and Cocktail hour earlier this month. Without her, it would have been different. Every single one of our guests loved her voice! She was definitely one of the highlights of the night. On the day of the event, she showed up on time and knew exactly what she needed to do even though she wasn’t in the rehearsal. She communicates so well with the wedding coordinator that I had nothing to worry about! When I heard her voice outside of the door, while waiting to walk down the aisle, I wished I could have just stood there and listened to the entire song! Then, Diana performed at our cocktail hour. She was the talking point for the night! All of our guests were standing around her and listening to her music and she even jammed a few songs with my uncle! Diana is such a talented pianist and vocalist. We did not give her a song list – you probably don’t need to. She will find the right songs for your group! Many guests commended on how great her performance was and how much it added to the atmosphere of the event. I highly recommend her and it was an absolute pleasure having Diana perform for us at our wedding! Diana was definitely the best money spent on our wedding! We found her on the Knot and instantly fell in love with her voice. We contacted her immediately and reserved her for our wedding day. We kept in touch over emails, in which she was always very pleasant and quick to respond. She was very flexible to work with and accommodated all of our request. She even learned a special song for us and provided us with a demo prior to the wedding. On our wedding day, we could not wait to meet her and listen to her perform. The day of the wedding, she was very punctual and professionally dressed. Diana's voice was flawless and very touching, there wasn't a dry eye at our ceremony. She created an unforgettable fairy tale ambience. Our guests were blown away by her performance and constantly complimented her on her talent. From start to finish, Diana was very sweet and professional. She is truly our favorite vendor and would highly recommend her to anyone wanting to make their wedding day, a day they would cherish forever! Thank you Diana, for sharing in our special day! Hi Leticia! Your wedding was gorgeous and I'm honored I was part of it! Moving people with music is always my goal :) Thank you so much! I found Diana through some online research that led me to her YouTube videos. When I listened to her play piano and sing, I got goosebumps!! I emailed her right away to reserve her to play for the cocktail hour at my wedding (8-2-2014). She was so pleasant to work with over emails and very responsive! When my wedding day came, I was anxious to finish all of our photos to make time for cocktail hour and hear her. I'm so glad that I did - she was fantastic! Her voice is flawless and I loved the ambiance she created. We didn't give her any direction on song choice and she did great! I highly recommend her service and will keep her in mind for future events or friends getting married :) THANK YOU Diana for being a part of our special day!! Hi Alaena! Thank you so much for your sweet review - I really enjoyed working with you :) So funny we know mutual people too...small world! We met Diana through our wedding coordinator and we are SO GLAD we did ! Diana played at our reception cocktail hour at our high end Indian-Persian reception. It was a big wedding with a lot of guests and everyone loved Diana's music, Diana did no just play the Piano but also sang for us. It was absolutely beautiful ! I would totally recommend hiring Diana to add to your event!! She was wonderful! Where do I begin with such an amazing person and musician as Diana? My now husband and I first met Diana a few years back. My husband found her through "the knot" and contacted her to donate her talents for a fundraising gala. She was kind enough to accept. I could not believe that my husband got such a professional to come play and out of the kindness of her heart. I knew that when we got married, I wanted her to sing for our ceremony! She is very professional yet very personable. She always arrived early, prepared, and very accommodating to our needs. I loved all the songs she sang; we did not even have to give her a list. Everyone at the gala and wedding loved her angelic voice and piano. For our ceremony, she did not even come to our rehearsal but she knew exactly how to fade in and out perfectly. We even gave her a song that she never even heard of to play during our wine box ceremony and it just made it so perfect. Diana is a true talent with so much passion for what she does and we are so glad that we met her. 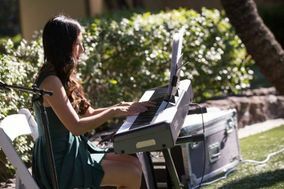 If you need a musician for your special event, please do not hesitate to go with Diana! Thank you, Chase and April! I'm so glad to have met you both and now have become friends :) Thank you for having me both at the gala and at your wedding day...such an honor for me! Glad you both are doing well! Event: Wedding -Diana provided music for our reception (cocktail hour and dinner). First we would like to say THANK YOU!!!!!!! Not only she is a great singer, she is a really great pianist. She is a great person to work with... Diana was wonderful to work with! She was always very prompt in getting back to us. My wife and I could say that she did an amazing job; the music and singing were just fabulous. We had many of our guest comment that the music and singing were just flawless. We also appreciate that she took her time to learn a special request for us, (to be able to sing in Spanish ….which is not her language) It came out perfect!! So if you’re looking for a great Pianist/Singer Diana is the way to go. I highly recommend her to anyone. My wife and I were just married this June, and we were very fortunate to have Diana play for us. Amid all the chaos (most likely just my own perception) of the wedding day, I distinctly remember listening to her music during our cocktail hour and the calming effect it had on me. So many of our guests commented on how her performance, warm energy and smile really added to atmosphere of our event. Diana is a very talented pianist and vocalist, with a range that really took us by surprise. She is also professional and very easy to work with, being both punctual and having a great understanding of what we were looking for. I highly recommend her for your event and would love to have her play for us again in the future. It was an absolute pleasure having Diana perform for us at our wedding! Diana Li Music performed for our wedding ceremony. Diana is incredibly talented and she did a wonderful job. We discovered her on theknot.com where she was voted for best of weddings and immediately fell in love with her voice. She is very professional and was a pleasure to deal with. She responded to our emails quickly and was always more than happy to answer any questions that we had. We highly recommend Diana for any special events. Diana, the keyboardist for my wedding ceremony, is not only a wonderfully talented pianist, who knew all the classical pieces I had hoped, she was prompt with all my email communications leaving no questions unanswered. She has a delightful personality and her professionalism and class made my wedding planning efforts to find beautiful music smooth and stress free. Diana also contacted the singer I had selected to coordinate their musical numbers, which was so helpful and made the wedding planning process so much easier for me. I would highly recommend Diana for any event that required a skilled pianist. Diana was a pleasure to work with! Extremely talented and loved working together. I would highly recommend her!